Mind-Pro Formula is a well rounded formula to support and enhance cognitive health and memory in adults. Memory loss is the result of multiple factors and not just a single cause. Vascular problems, insufficient blood flow to the brain and oxidative stress can impair memory and affect cognitive function. Decreased blood flow to the brain means decreased nutrients that enhance brain function. Oxidative stress can also damage neurons in the brain and lead to memory loss. 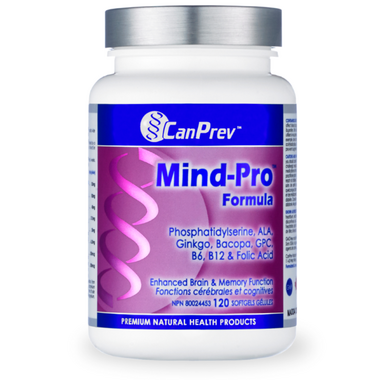 Mind-Pro Formula provides herbs and important natural nutrients, such as ginkgo biloba and phosphatidylserine, to increase circulation and enhance cognitive function. Mind-Pro Formula also supplies various antioxidants to counteract free radical damage. Mind-Pro Formula is ideal for those looking for an all natural product that provides nutritional support to enhance memory and cognitive function. Directions: Adults - Take two (2) softgels twice (2) daily with meals or as directed by a healthcare practitioner. Great product for brain health. Contains all the suggestive supplements as directed by neurologist. Great product to assist with cognitive and post-concussion recovery. My teenage son takes the supplement and he feels that it has assisted with recovery from a concussion he sustained playing football. Keep in mind this is not a cure but it will help.